Have you seen this pattern? Motion Commotion by Suzanne McNeill http://www.d-originals.com/. During one of my online surfing moments it appealed to me. ﻿And I thought it was a good candidate for a potential class because a lot of people are intimidated by curved piecing. The description of the pattern said, "Easy Pattern with Straight Seams that Look Curvy!" An enticing description. It arrived in my mailbox quickly and upon receiving it I realized that is was made using precuts, either a layer cake or four charm packs. Perfect! My focus was to create classes using precuts. So many of us are drawn to purchase precuts but are lost when it comes to using them. 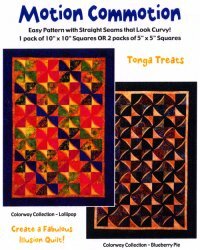 AND I just happen to have a Tonga Treats Lollipop layer cake which is what was used for one of the quilts on the pattern cover. This just keeps getting better! So, here's my finished quilt. Of course I can never seem to make a quilt according to the pattern and this was no exception. There are an extra six blocks in my version cuz I wanted it a little BIGGER (from 46"x64" to 56"x65"). Of course, that meant a layer cake was not BIG enough so I had to pull coordinating fabrics from my very limited supply of batiks (REALLY! I have a VERY SMALL stash of batiks). AND the thing that I thought was VERY CLEVER was that I made some of the blocks dimensional, 12 blocks have pocket! But then... all those clever little pockets made the quilting process more difficult. :-( And then... when I was searching for a picture of the pattern to post here for you I discovered a video the designer made showing you how to make the blocks with pocket! Oh well, so much for being clever. I am not intimidated by curved piecing and for me it was more difficult to use this technique to create the illusion of curved piecing than it is to do curved piecing. And I happen to be a label maker. For me the label is part of making a quilt. 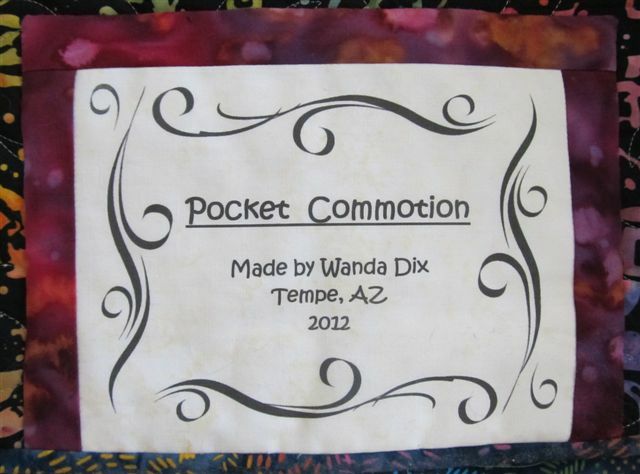 As you can see I titled this quilt Pocket Commotion (because I was proud of the pockets and they did cause some quilting commotion). Often times my labels contain more info than this one. Such as who it was made for or what inspired the design if it's one of my originals. They are always printed on my home printer using a word doc program. 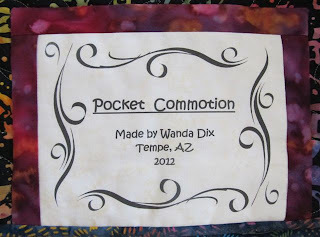 Sometimes I include a printed picture representing the theme or a pieced block from the quilt front and I've also done applique work on labels. Labels are like little quilts! Several (or what some would call MANY) months ago my youngest daughter (the one that DOESN'T sew) asked me to make her a potato bag. I'm sure you know what these are... a container made of cloth that one uses to successfully microwave potatoes... think baked potato. Funny how times change... I don't think my mother ever BAKED a potato in her life (at least not the part of her life when I lived with her). She said, "It takes to long and runs up the electric bill!". ﻿Evidently there are others out there that felt the same way as dear ol' mom and one of them came up with a way to modernize the process using a microwave. Several months ago (NOT MANY) I purchased a couple fat quarters to make dear daughter her potato bag. 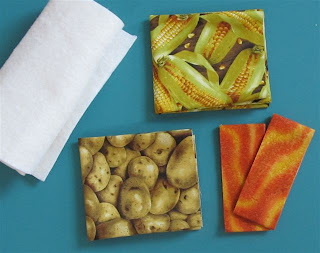 One fabric is a potato print (how original) and the other is a print of corn on the cob. Corn on the cob because, in case you didn't know... these little bags also work well for cooking corn on the cob in the microwave. This daughter does not have many domestic bones and I thought using prints that represent the foods that can be cooked in the bag would be helpful to her. The only other things needed was some leftover binding and batting from other projects. Finally! A project that got completed (in a timely manner) instead of becoming an addition to the UFO pile! 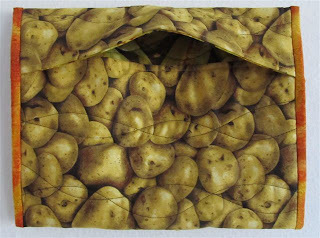 The finished size is 12"x9", big enough for three good size potatoes. One for her and each of her two roommates.﻿ As for dear ol' mom... sometimes I imagine her watching over me amazed at the new fangled way some things get done today. Yesterday my friend Jane came over and spent the day with me and the longarm. Jane, being the best Grandma ever, made a patriotic quilt top for each of her 5 grandsons. Like most quilters I know, Jane is a checkbook quilter and would rather piece a top than do the quilting. But she is also an adventuresome kinda gal and took me up on the offer to come give the longarm quilting experience a try. Jane picked a panto with a meandering star design and used blue thread. They were a perfect match for this quilt top. Jane and the longarm played very well together and her quilt top was finished in no time. We even had a nice leisurely lunch at Tott's Asian Diner around the corner from my house. We got the quilt squared and ready for binding. She hoped to get a binding sewn on before her head hit the pillow so she could take it to her R.U.A. Quilter friendship group today and show them that she really is a QUILTER! 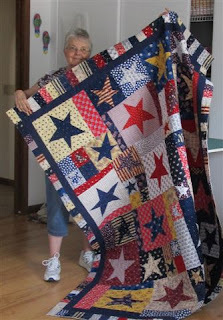 I think Jane may come back (at least four more times) and quilt that pile of patriotic quilts! 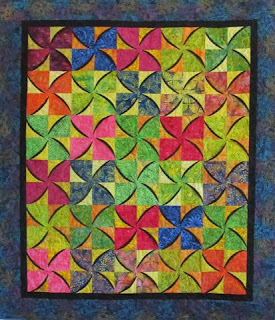 Today as I stood in front of the design wall gazing at what is currently hanging there (my Quilted Symphony project) waiting so patiently for me to give it life, the thought crossed my mind that I had not shared my progress with the blogging world in awhile. So here it is. My Quilted Symphony project has been down off the design wall a few times since my last post about it. As you can see it is now one piece instead of several little sections. I've done some surface embellishing with yarns and have some quilting stitches in it. I'll post some close ups as I get farther along with my progress. Speaking of progress... I know you are probably thinking, "Enough already! Just finish it!" I think my creative juices have sat still for so long (it has been 3 or 4 years-so long I've lost track of the time) that I think they appear to just be running at a trickle these days. I guess it's like that saying I've heard throughout my life, "Use it or lose it." 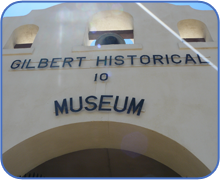 Yesterday a friend and I spent a few hours at the Gilbert Historical Museum. http://www.gilbertmuseum.org/ I go there every year about this time to tour their annual Quilt Show. The show offers up some eye candy that makes ya say Ohhhh... Ahhhh.... If you are into old quilts there are always a lot of those and more hand quilting than I've seen at any other show. 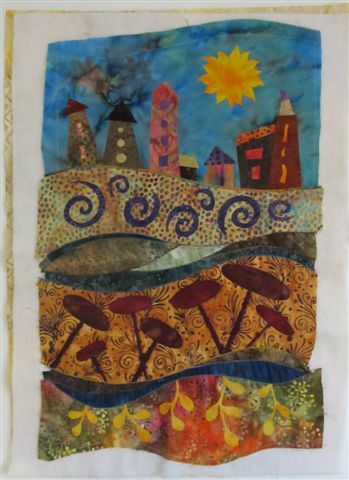 Of course, there are also art quilts scattered throughout by some local artist that we quilters recognize the names of like Susan Vassallo and Vicki Bohnhoff. It's not a BIG show but still enjoyable. If you're interested in checking out the show you still have time. The show runs until May 31. Cost of admission is a mere $5 and that included access to all the museum exhibits. 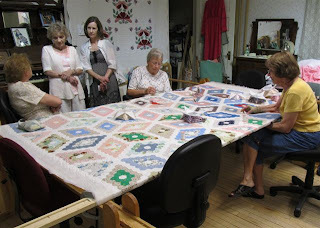 While at the show I always stop in and see the gals that do hand quilting at the museum.﻿ These ladies have been getting together at the museum every Tuesday and Thursday for years. They usually always have two frames up and each loaded with a vintage quilt they are working on. They are always friendly with visitors and very willing to show and tell what they are working on. 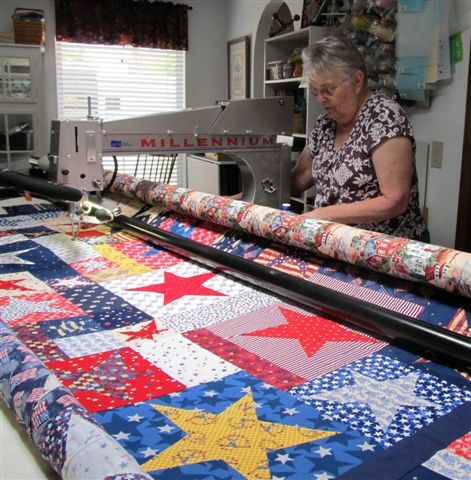 People send them quilts from all over the country to be hand quilted. If you've got an old quilt you'd like to have them quilt, there is a two year waiting list. All the monies charged for their beautiful hand quilting is donated to the museum.